Summary: When we add shot information, we always input our actual distance to the hole in the 'distance to hole field'; even if we aren't intending to hit the ball that entire distance. On a 2nd shot on a par 5, even if you are not 'going for the green', you should still enter the actual yardage you have to the hole from the position of your shot. Even if you're hitting a layup shot, this total shot distance could be something like 350 yards, and this is the number that should go into the 'distance to the hole' field (not the distance you are actually trying to hit). 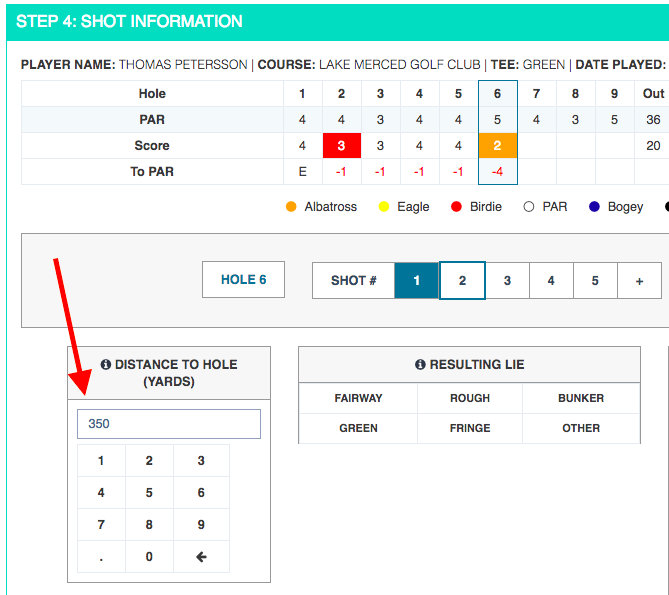 In the above example, this user has 350 yards to the green, and hence, inputs 350 in the 'distance to hole' field. This is regardless of how far this user is actually trying to hit the ball. The key is to always enter your actual distance to the hole in the 'distance to hole' field.